Two days after I went to rehab, a close friend, Chloe Ann, came to visit and brought a soft, cuddly, stuffed bunny. It was a light brown with slightly curly fur and long ears that were velvety inside. I was so pleased with that bunny, just what I needed at that moment. She thought I would have plenty of flowers and things and when she saw the bunny, she knew it was just the right thing. I slept with the bunny every night and any time I had a nap in the afternoon. I asked the bunny if it would tell me if it was a boy or a girl. She let me know she was a girl. I asked her if she would tell me her name, so far she hasn’t, so I call her Bunny. One of the nurse’s aid, Eleanor, decided her name was Cozy because we looked all cosy together in bed. When she made my bed, she would sit Bunny up again the pillows and spread her ears across the pillow. One day I said to Eleanor – “You haven’t finished making the bed”. She came over and looked, studied the bed for a bit to figure it out. Finally she realized Bunny was on the chair across from the bed. She laughed and put Bunny in her usual place by the pillows. I had many people compliment me on my Bunny, they thought she was so cute and adorable. When they woke me up at night for blood pressure and who knows what else, they were often surprised to see me with Bunny, but also raved about her as well. When I was moved upstairs to another room because I didn’t need nursing care, just therapy, I was in my wheelchair with Bunny. As I went down the hall I heard people laughing and enjoying the picture we made – I had buttoned Bunny into the front of my sweater so she wouldn’t fall. She was facing out so she saw where we were going. 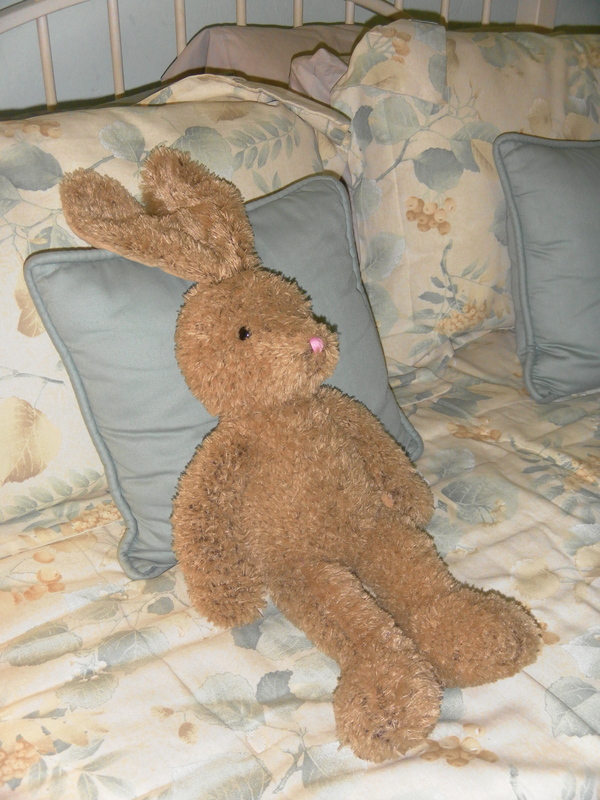 Bunny has been in our room since – I just realized I hadn’t taken her with me to the hotel. She would have been company since I spent most of the nights by myself because it was extra traveling for Eddie. Oh well, she was waiting for me when I came home. When Eddie makes the bed, he puts Bunny in the middle between the pillows. I have had trouble sleeping comfortably with the hips and legs, I do a lot of tossing and turning, which keeps Eddie awake a lot. I either sleep on my side or on my back propped up with some pillows, sometimes it works and sometimes it doesn’t. I don’t sleep enough to really feel rested, I am hoping one of these days it will all settle down. I will come clean, for the past three weeks I have been sleeping with Bunny again. What I find interesting is that I am sleeping better with her in my arms. I don’t know if it is psychological or that Bunny has a special vibe for me. I just know I have slept better in the last three weeks. Now I have had some nights that have not been so swift even with Bunny, but on the whole it is better than without her. I realize to some it is ridiculous for a 65 year old woman to sleep with a stuffed animal; however, I am not interested in other opinions. It is working for me and that is all that matters. Of course, after this post is published, the whole world will know instead of just me and Bunny. My guess is that I am not the only one who sleeps with a plush animal. Here’s to all of you! I am going to publish this right now and may have more to add later. This entry was posted on June 24, 2012 at 9:12 am and is filed under Musings. You can follow any responses to this entry through the RSS 2.0 feed. You can leave a response, or trackback from your own site.